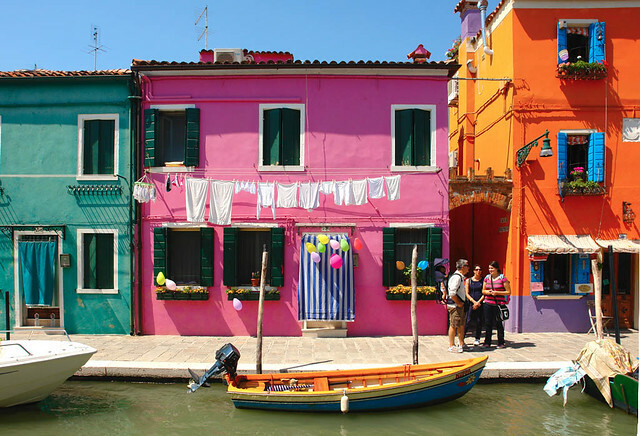 Cities around the world are feeling increasingly homogenous and gray, so it’s nice to know there are still colorful locales where you can stumble along a hidden cobblestoned alley and take in a rainbow of color, gaze at massive murals splashed across entire neighborhoods and interpret fun artistic flourishes that tell a story about the history of the area. 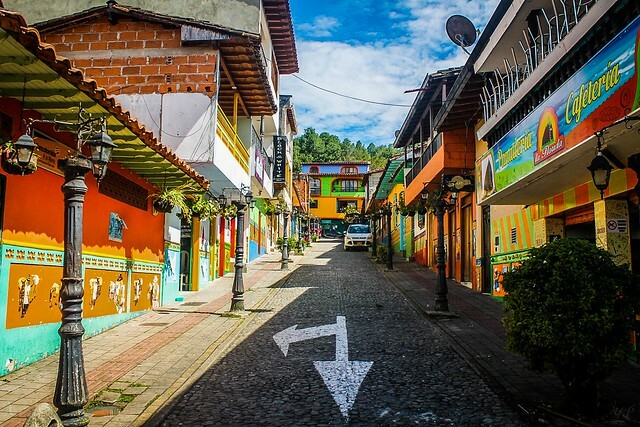 From Colombia to Moscow, here are 11 of the world’s brightest towns and neighborhoods, all with their own unique character. 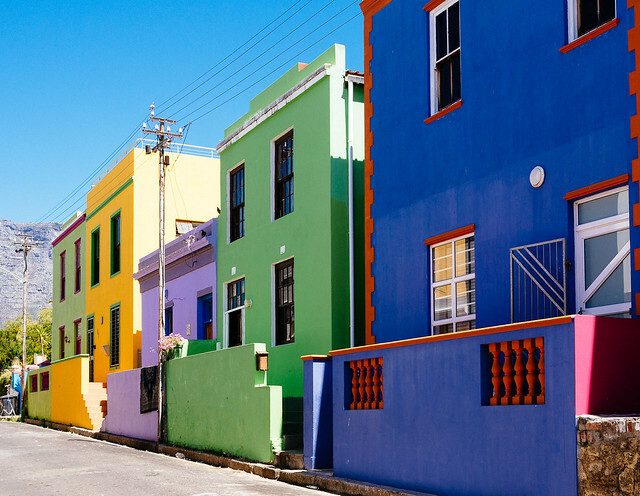 The brightly colored homes and cobblestoned streets of Bo-Kaap, an area of Cape Town formerly known as the Malay Quarter, have a fascinating and inspiring origin. When it was first colonized by the Dutch in the late 1700s, the area’s indigenous tribes fought back, refusing to cede their land or work for the invaders. So, the Dutch kidnapped people from Malaysia, Indonesia and other parts of Africa and forced them into slavery. Most of the slaves were Muslim, and they erected several mosques in the area. Even before the emancipation of the slaves in 1834 and the arrival of more liberated slaves from other areas, Muslims began immigrating to the city, bringing their own cultural traditions with them. 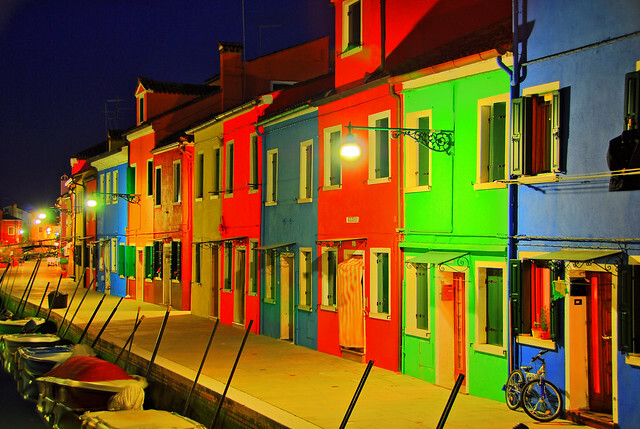 While they were on lease from the Dutch, the facades of these buildings were all white. 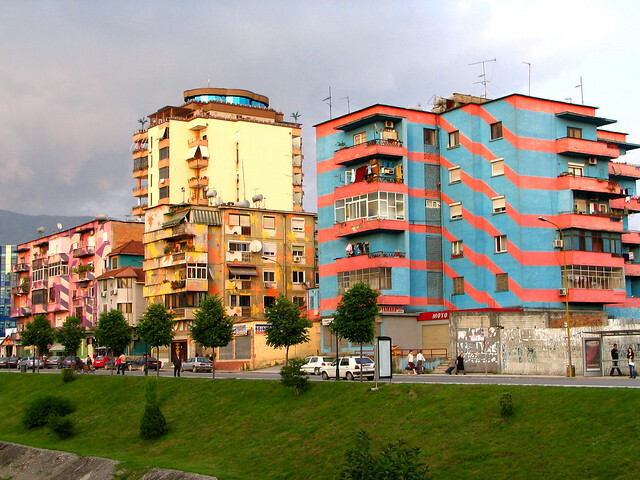 After the liberation, the locals painted them in bright colors, as they remain today. 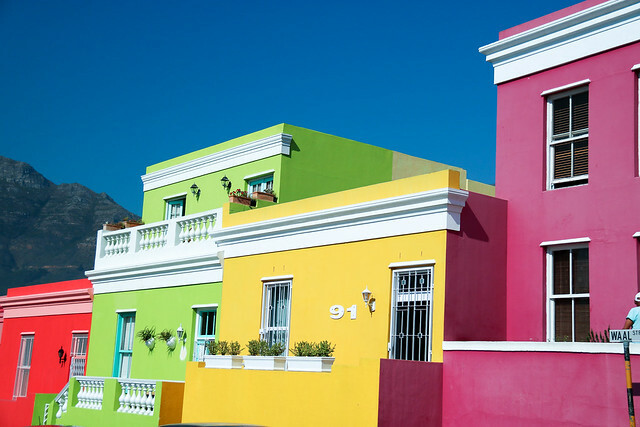 Unfortunately, Bo-Kaap is falling victim to gentrification, some of its distinctive character wearing away as wealthy outsiders move in and purchase property, evicting long-term residents. 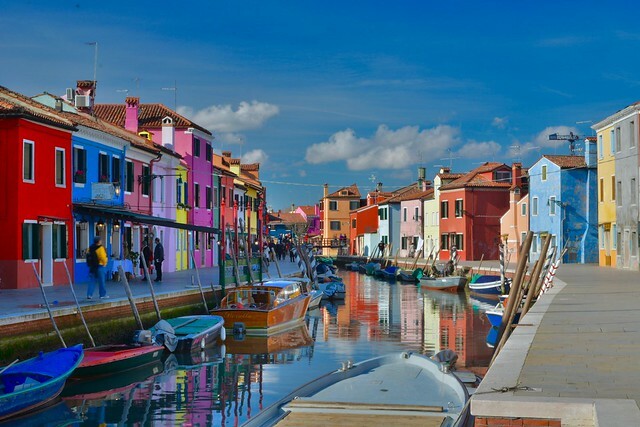 An island in the Venetian lagoon known for its beautiful traditional lacework, Burano is also one of Venice’s most colorful locales. 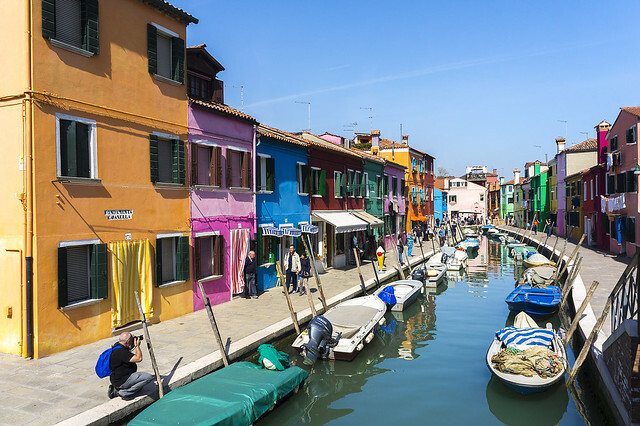 Accessible by Venetian water bus or via a bridge from Mazzorbo, Burano is densely populated with locals as well as tourists, who flock to the island to see its vividly painted houses. 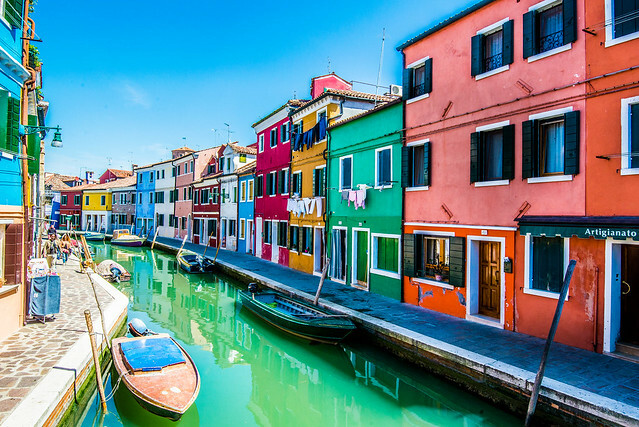 It may look like a color free-for-all, but there’s actually a tightly regulated system to the rainbow, and anyone wishing to paint their home has to go through the government first and choose from a small number of permitted colors for that particular lot. 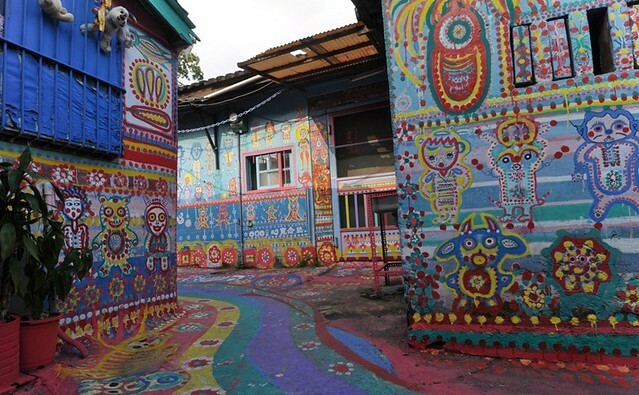 The appropriately named Rainbow Village in Taiwan’s Nantun District was created by former soldier Huang Yung-Fu, who grew up there and saw his once-bustling village of 1,200 homes dwindle down to just 11 by the time he returned from a stint fighting communist troops on the mainland. Developers had begun buying up the land for redevelopment, and it wasn’t long before nearly all of Huang’s neighbors had left, and he became the lone holdout in the village. In a bid to save the remaining 11 homes from demolition, he began covering them in a distinctive pattern of birds, flowers, animals and human figures. 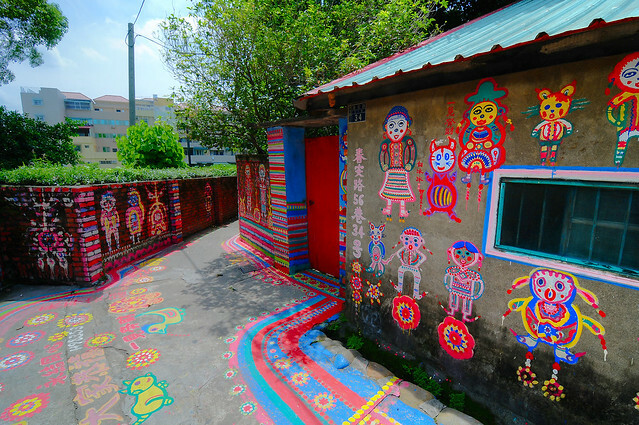 When local university students discovered Huang’s work, they campaigned to preserve the village, and it was ultimately made into a cultural area by the authorities. Now it’s a popular tourist attraction drawing in more than a million visitors every year. 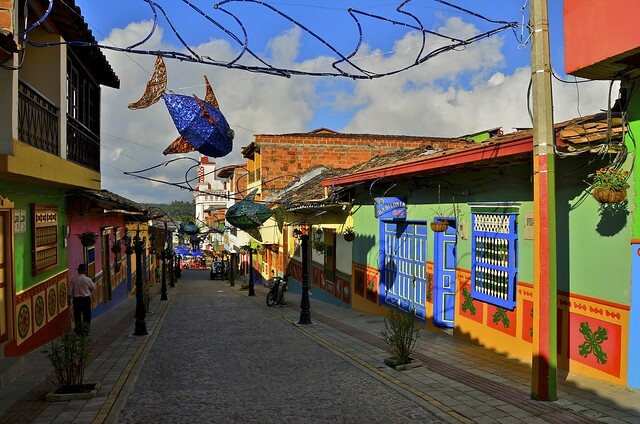 Guatapé is known as the most colorful town in Colombia, set on the outskirts of Medellín and bordered by a reservoir created for a hydroelectric dam. 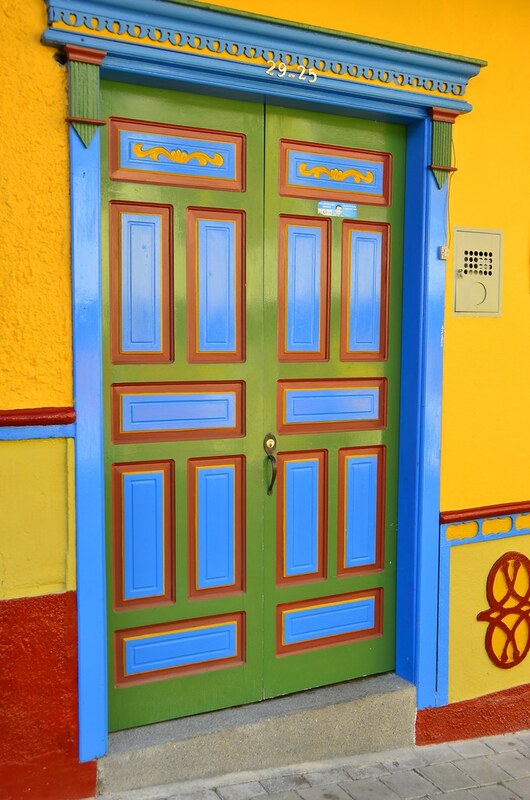 It’s not clear exactly how and why the tradition began, but at some point in the neighborhood’s history, someone decided to decorate the exterior of a building with custom millwork and illustrated cut-outs depicting the heritage or nature of the family or business inside. 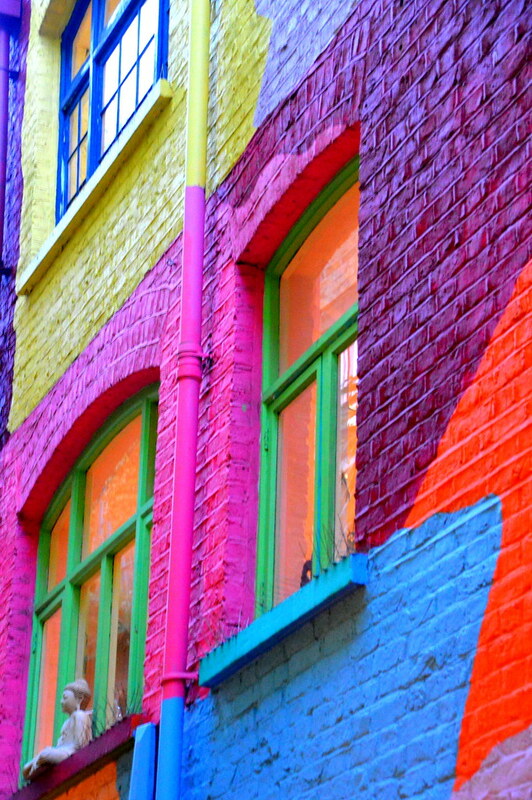 The trend took off, and now many of the buildings are covered in these fun little hints at the area’s past and present. 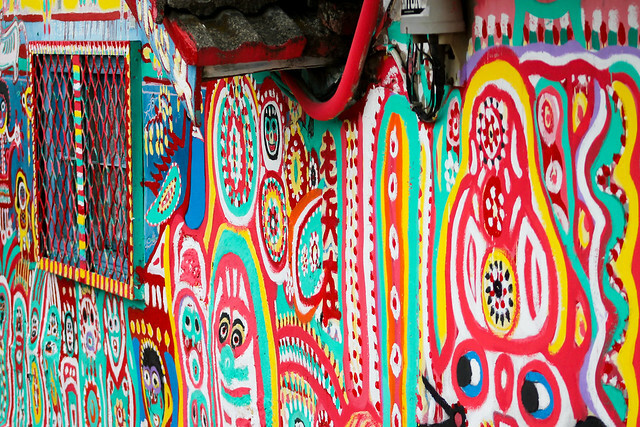 Colorful shades and patterns have become such an intrinsic part of the town’s identity, even the tuk-tuks carrying tourists through its streets are decorated. 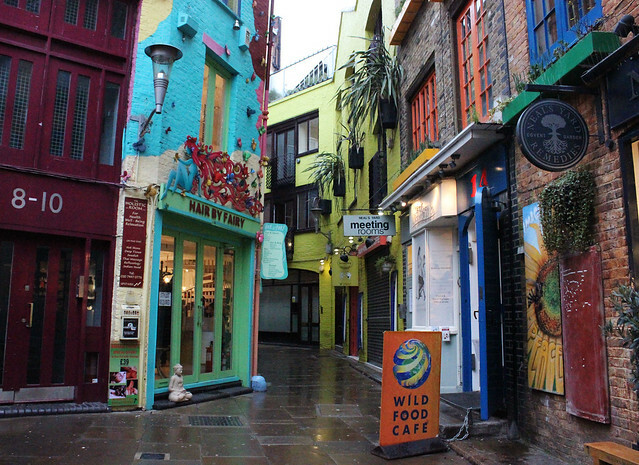 Stumble into the small alleyway in London’s Covent Garden known as ‘Neal’s Yard’ and you’ll feel like you’ve found a whole different city-within-a-city. 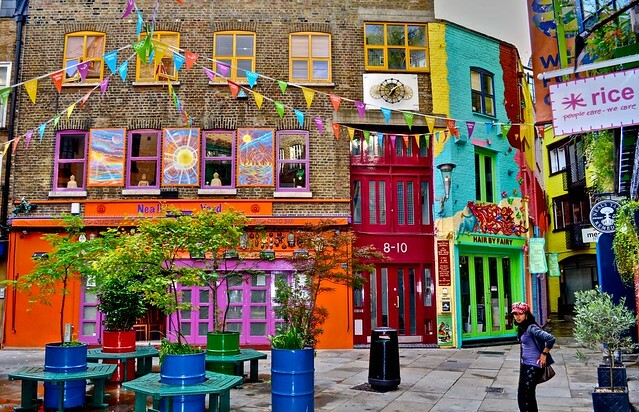 Taking its name from an old warehouse for the nearby Covent Garden fruit and vegetable market, the little square is easy to miss if you don’t know about it. 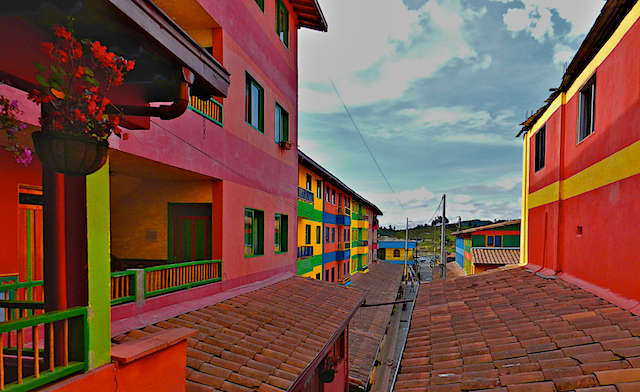 Many of the buildings are painted in vivid colors and decorated by murals. 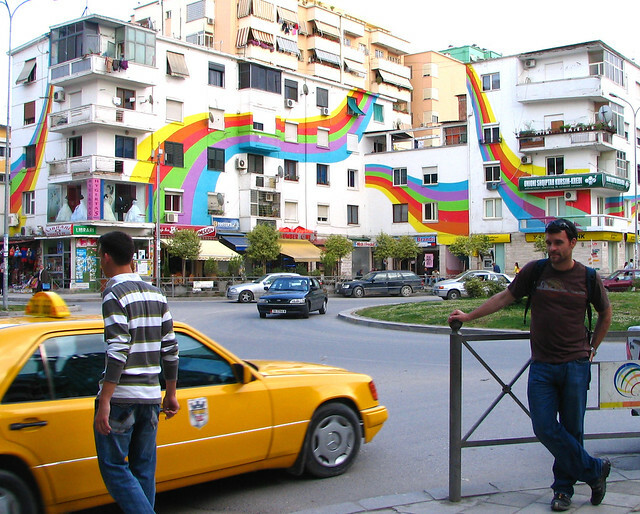 Prior to the 2000 election of Edi Rama as mayor, who was an artist before becoming a politician, Albania’s capital city of Tirana was looking a little worse for the wear. 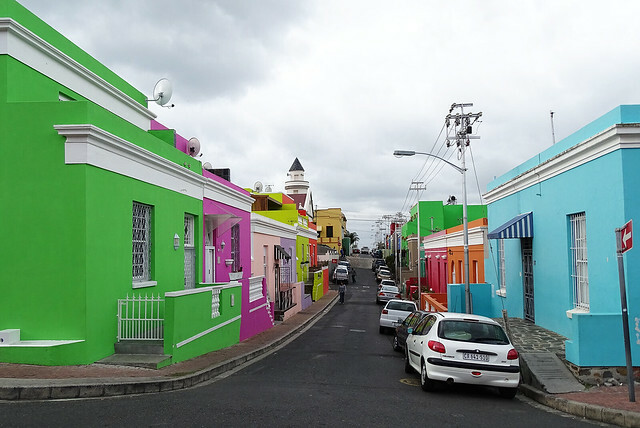 Hoping to help inspire a sense of pride in his constituents, Rama first painted one peeling gray building a bright sorbet orange. Then he gave another a graphic treatment in red, blue and green. 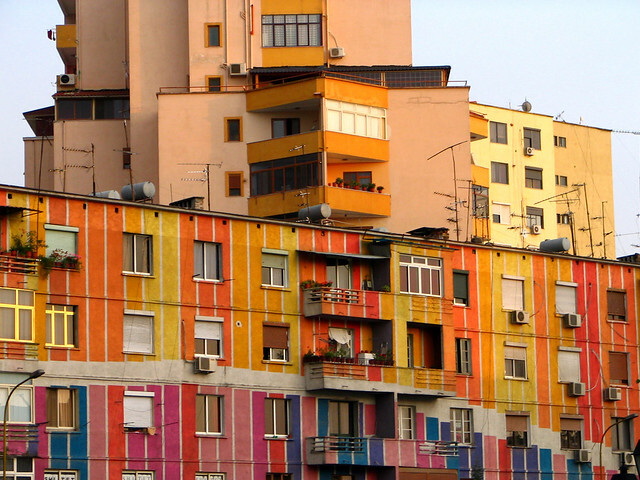 Then came larger, more ambitious makeovers, radically changing the mood of the city. Soon, Rama claimed, locals were dropping less litter and crime rates fell. 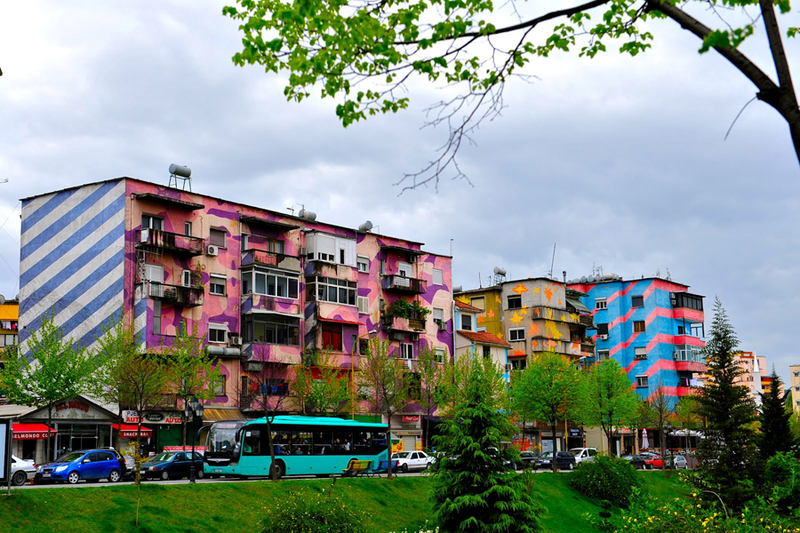 Though he met with resistance from other members of the European Union for his unusual project, he kept it going until many of the city’s old buildings were works of art.